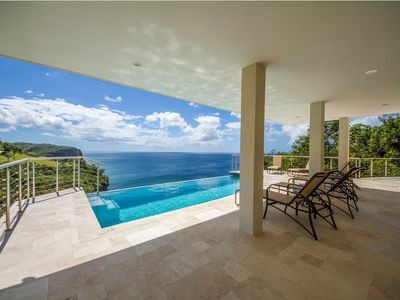 Beau Rivage is a luxurious ocean view gated home, located on approximately two acres situated in a gently sloping garden overlooking the Caribbean Sea and within a 400 yard walk of Anse du Cap beach. Due to last minute cancellation, Beau Rivage is offering a 20% discount for January 28 to February 9th 2019 only. Pay summer rates in best month of high season winter. Beau Rivage is part of the Cap Estate development, an exclusive planned community located on the northern side of the island. 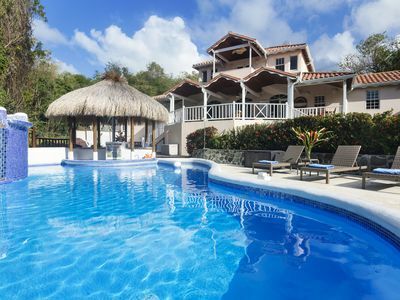 We are the only 5 Star 6 bedroom/bathroom rental villa in exclusive Cap Estates and one of few villas within walking distance of the beach (a short 5 minute walk); a double bonus when planning destination weddings, extended family vacations or special occasion events. 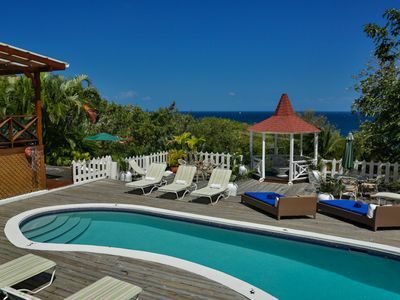 Beau Rivage is also one of the most 'child friendly' villas on island, offering two portable cribs, a trundle bed, a playpen, a high chair, and custom made baby gates on our main veranda at no additional charge for up to 14 guests. In our high season (from Dec. 15 - April 15) we offer four bedroom rates at $1000 USD per night, five bedroom rates at $1250 per night, and six bedroom rates at $1500 USD per night, inclusive of taxes and staff. 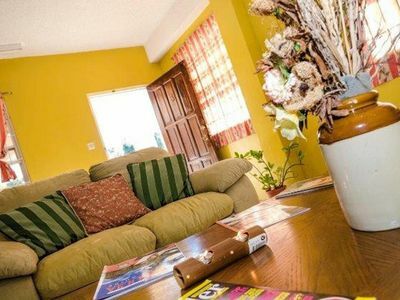 Regardless of the number of bedrooms rented, these rates include exclusive use of our property. In the off-season (April 16 to Dec. 14), our four bedroom rate is $800 USD per night, our five bedroom rate is $1000 USD per night, and our six bedroom rate is $1200 USD per night, also inclusive of taxes and staff. We also occasionally offer one, two and three bedroom rental rates, depending on the dates requested. Since the new 'Instant Quote' system offered to potential guests by HomeAway/VRBO does not allow guests to include the number of bedrooms they are interested in renting, guests are cautioned that these quotes may be inaccurate and that the owner will provide a final quote using the above rates once the number in the party and the number of bedrooms required has been determined. Our villa is a gated property with an expansive circular drive that takes you to the entrance of the main house, which is tiled throughout with elegant travertine marble tile imported from Turkey. 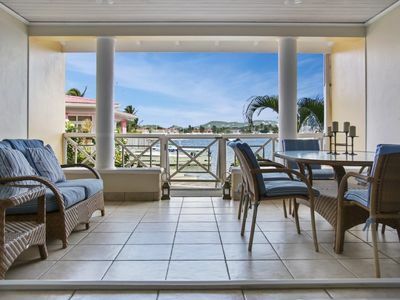 The large entry foyer leads into an expansive open plan living/dining room and kitchen, which opens onto a spacious veranda having ocean and garden views. The large gate, elegant entry and circular drive is perfect for large functions such as weddings and birthday celebrations. Upon arrival at Beau Rivage, you will be greeted by Kris, our property manager who lives off-site only minutes from our property. Kris provides fantastic personalized services, to include arranging for airport transportation, activities, grocery shopping, etc. Kris can also arrange to have groceries at the villa and there awaiting you upon your arrival for a small additional charge. Included in our price we offer two full-time cooks/housekeepers who will prepare two meals a day six days a week, as well as provide daily maid service. Our staff will share their wealth of local knowledge during your stay and are wonderful with families having small children. 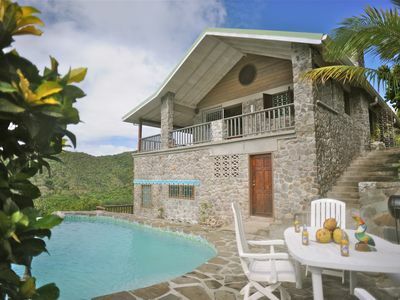 Beau Rivage, which was completed in March 2007 and is one of the newer villas on island, consists of a four bedroom main house and a two bedroom guest cottage, located in a lush tropical garden setting built around the pool, swim-up pool bar and spa. The total living space is approximately 6000 square feet. The living room boasts a large sectional sofa, with a 65 inch screen TV. The surround sound stereo system complements the DVD/CD players and IPOD docking station. With a three-zone speaker control system, guests can play their favorite music in the living room, on the veranda, and at the pool Tiki bar, or even set the mood for a romantic, champagne evening in the spa. Guests are encouraged to bring their favorite music to play on the IPOD docking station or the CD player through speakers which have been installed in the main living area, the outdoor deck and pool bar. Access to the owner's DVD/CD/Book library is available to villa guests free of charge. 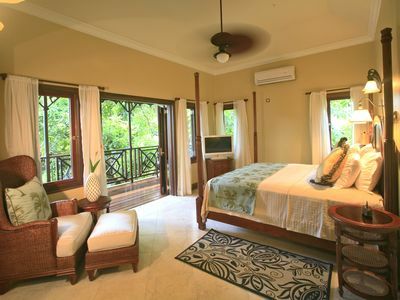 All of the bedroom/bathroom suites in the main house and cottage are air-conditioned with optional ceiling fans throughout the villa. Central air condition in the main living area, which is normally not necessary, is also available at an additional charge. The main dining area can seat 10 people and the adjacent kitchen is fully equipped with two dishwashers, toaster, coffee maker, blender, dual-ovens, wine chiller, five burner electric stove, four burner gas stove and Sub-zero refrigerator. 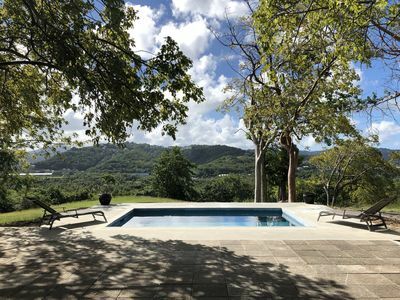 Guests can enjoy the view and the cool tropical breezes from the spacious veranda which is situated off the dining/living rooms and which overlooks the pool area. This veranda is equipped with comfortable chairs for relaxing and also with two tables where up to 8 persons can enjoy al fresco dining. 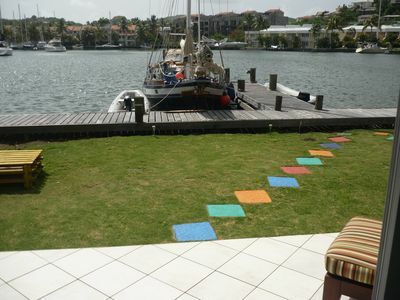 The veranda also has custom made baby gates which are wonderful for toddlers. In the main house, the three, fully air-conditioned downstairs bedrooms are each furnished with a queen size bed. Each of these bedrooms have an en-suite bathroom, and two of these bedrooms have a private patio overlooking the pool. 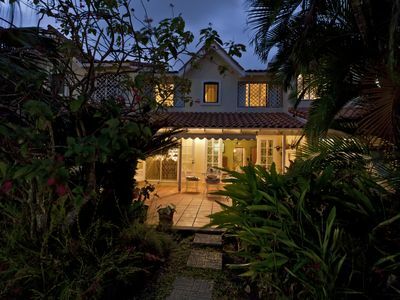 The master bedroom is situated upstairs from where guests can enjoy a sea view from their private patio. This bedroom is equipped with a 42 inch plasma TV, a DVD player, an IPOD docking station and surround sound system. The master bedroom boasts a luxurious king-size bed, with the finest of Egyptian cotton linen. A spacious walk in closet, en-suite bathroom with a shower and a large Jacuzzi tub, complete this private romantic 'Honeymoon Suite'. The cottage is located across the garden from the main house. 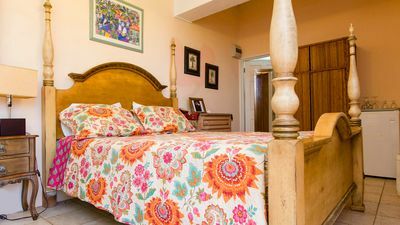 Guests enter the cottage through a large shared patio which opens through separate French doors into two over-sized separate air-conditioned bedroom/bathroom suites which are even larger than the guest rooms in the main house. There is a lovely spacious, king-size bed 'honeymoon' type bedroom/bathroom suite in one of the cottage rooms. The other spacious cottage suite has two queen size beds and a spacious en-suite bathroom. 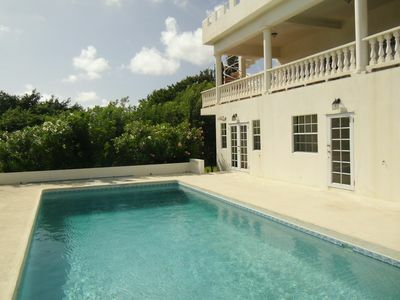 Views of the ocean, garden and pool can be seen from the cottage patio. The attractive pool area has a wide pool deck equipped with 14 loungers for sun worshippers and a charming thatched roof provides shade for the swim-up bar area which is equipped with a sink and ice maker. The 31 foot pool is complemented by a swim up bar with six swim-up bar stools and a spa pool, situated at a higher level. A soothing waterfall overflows into the main pool from the spa. For an additional charge of $100 USD, guests at Beau Rivage upon request will be provided with two passes to the gym at the world renowned Oasis Spa located at the Le Sport Hotel situated just a few minutes walk from the villa. These two passes, which are under the name of the villa, can be used daily by any two guests at a time throughout their stay. Treatments at the spa such as massage, facials, etc can also be arranged for an additional charge. 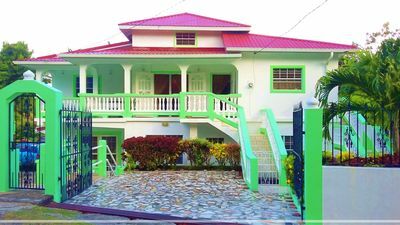 Use of the owner's private gym, located on the premises adjacent to the pool, for liability reasons, is not included in the rental of the villa. This is truly a world class destination designed for the discriminating traveler with spas, golf, night life and elegant restaurants all within a short distance of your private garden villa. 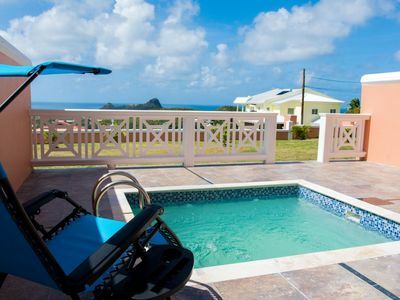 Beau Rivage is less than 1/4 mile from the St. Lucia Golf and Country Club. This beautiful golf course offers reasonable greens fees and a brand new clubhouse where daily meals are served at the restaurant and bar. 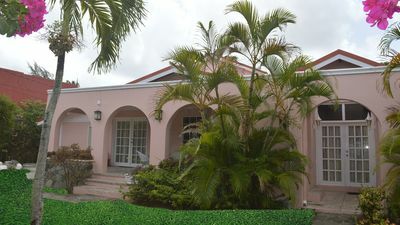 (Click below links for more information about St. Lucia Golf and Country Club). 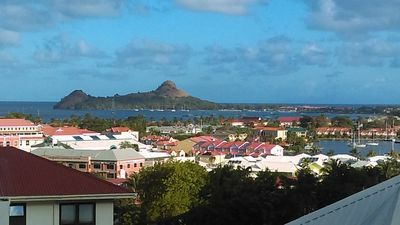 Rodney Bay Marina, one of the best marinas in the Caribbean, is located about a 10 minute drive away with easy access to various boating day trips and a wide choice of superb restaurants and night life. Beau Rivage was designed with all the comforts and luxurious amenities of home, combined with the elegance and serenity of the Caribbean. 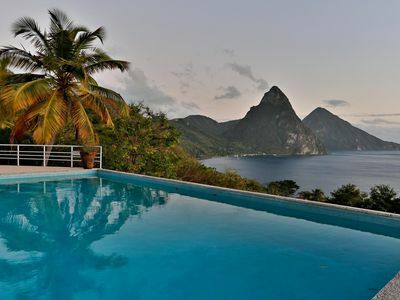 We invite you to come and experience simply beautiful St Lucia and our enchanting Beau Rivage villa. 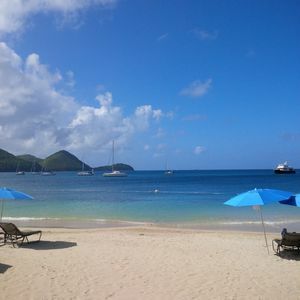 Let us make your dream Caribbean wedding, honeymoon or vacation come true. Everything is possible at Beau Rivage. 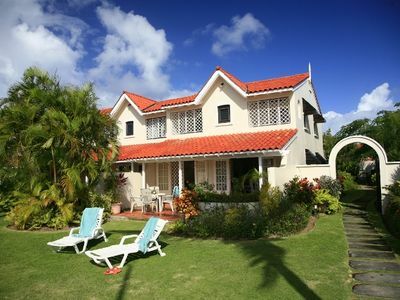 Villa with stunning views - CHEF, Housekeeper services. ROOM WITH A VIEW IN A ONE OF A KIND ART EMPORIUM. 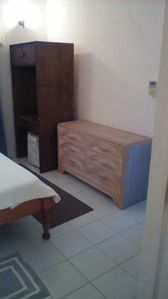 One bedroom apartment fully furnished. 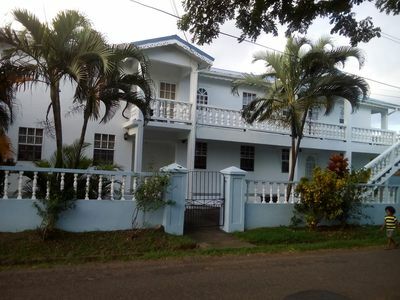 COCONUT: Secret Apt, 4-Poster Bed, Breakfast, Large Pool, Private Entrance.